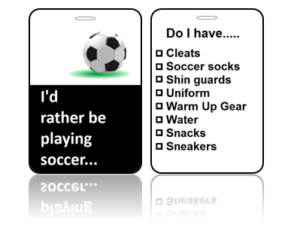 Sports Bag Tags Football Championships - check out our designs! Quantity discounts are available, for quantities over 250?Click here for quote. Each Bag Tag includes (1) Luggage Loop!? Sports Bag Tags Football Championships are a great way to pay tribute to the hard work and dedication of your team! In addition, you can also add your contact information, an itemized checklist or a personalized message to the back of the Tags, which adds a special touch. In order to support your team, design Bag Tags with your Team Logo. Great for Tennis, Soccer, Lacrosse, Football, Basketball, Baseball, Dance, Swim Teams and more. For instance, share Bible Scripture Bag Tags with others, to include bible study, adult and youth groups. Create your own with your favorite Scripture. Vacation Bible School and Blessings of the Backpacks! Perfect for first, second, third and fourth graders to collect, share and trade with friends! Attach to a diaper bag. Share-IT! Tag customers not only want to share their favorite bible scripture verse. They also want to share memories, words of encouragement, bring teams together, celebrate, and provide motivational and inspirational messages. Our goal is to provide an economical way to reach out and share His Word. Share your positive message or memories to as many people as possible. As a result, we’ve developed a special keepsake. 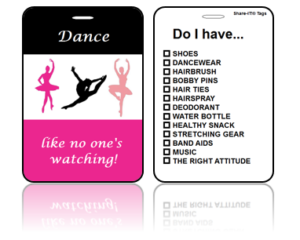 You can easily have your message or special memories printed on an attractive bag tag or key tag. Our hope is these Sports Bag Tags Tennis Greener Grass are a blessing to you. Sports: an activity involving physical exertion and skill in which an individual or team competes against another or others for entertainment. EACH Quantity discounts are available, for quantities over 250? Click here for quote. 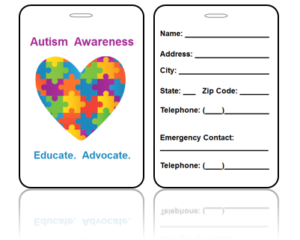 Awareness Bag Tags - Autism Educate Advocate Add your contact information or a personalized message to the back of your tags.Size: 3.88" x 2.63" Material: Durable PVC Plastic Features: High Definition Print Pre-punched HoleEach Bag Tag includes (1) Luggage Loop! ?Not exactly what you were looking for? Click Create Design!